Join the Tin Man on his journey, along with Dorothy, the Scarecrow, and the Cowardly Lion. 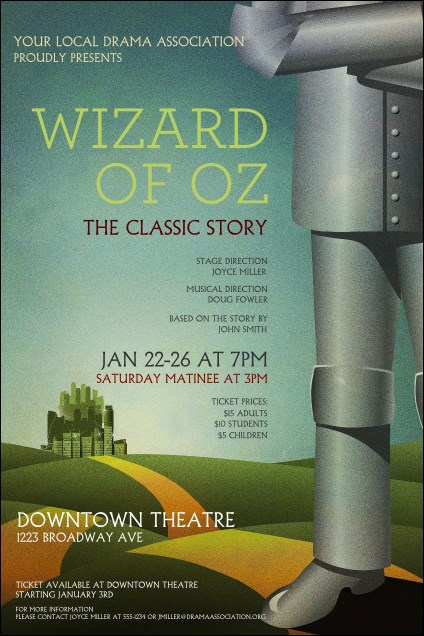 Post the Wizard of Oz Poster before your show. Emerald City beckons in the distance, with a big blue sky above. Enter 23 lines of text on this spacious template. Don't forget your ruby slippers - and your little dog, too! Follow the Yellow Brick Road to TicketPrinting.com!